Técnicas Evaporativas, S.L. is a leading established company in the design and manufacturing of evaporative cooling equipment for water cooling, industrial liquid and refrigerant gases. Cooling solutions of TEVA with experience of almost 50 years in many sectors designed and tailored to client’s needs are made of FRP or steel and with use of axial or radial fans. Constantly improved technical design and use of materials offer high-quality execution equipped with reliable components from renowned brands for the guaranteed capacity, safe operation, long service life, durability and resistance to corrosion. 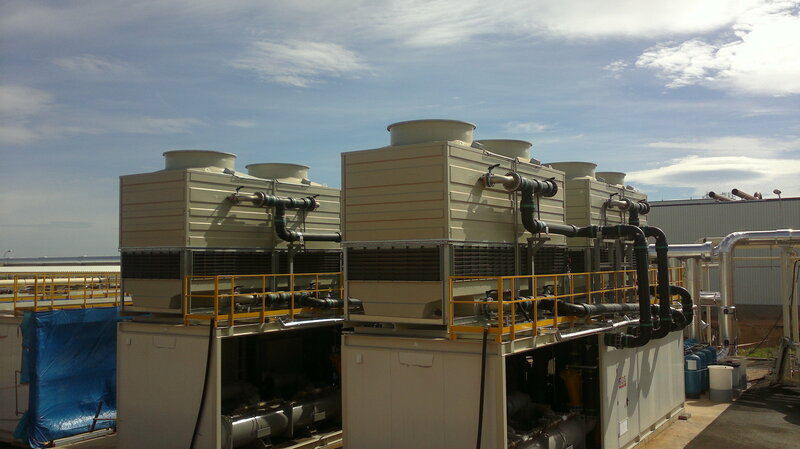 These features make the TEVA cooling towers ideal product for contractors and end-users maintaining high standards and quality combined with co st-efficient approach and delivered on plug & play basis. Nominal capacities from 82 to 2.612 kW for units in FRP with axial fans and from 123 to 1.610 kW for units with radial fans. Nominal capacities from 160 to 3.685 kW for units in galvanized steel with axial fans. and from 75 to 3.122 kW with radial fans. 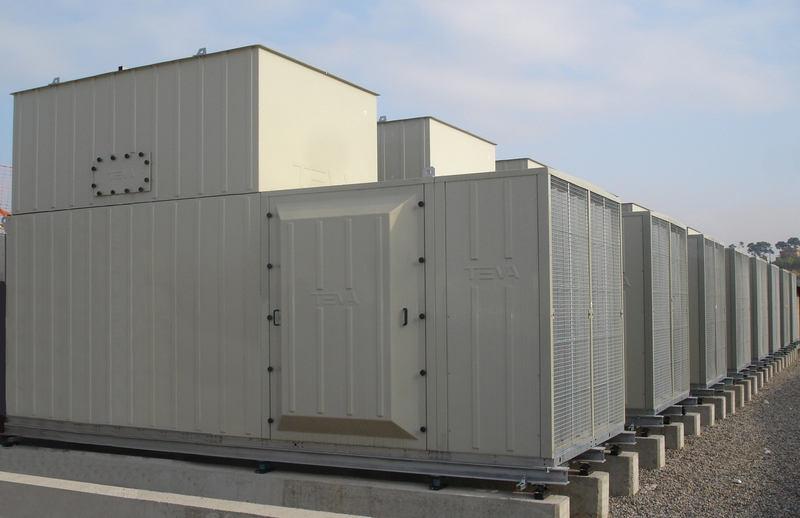 FRP package units available up to 5703 kW with ultra-low noise execution. Nominal capacities from 35 to 1.602 kW for units in FRP with axial fans and from 35 to 940 kW for units with radial fans. Nominal capacities from 32 to 2.436 kW for units in galvanized steel with axial fans.and from 44 to 1.957 kW with radial fans. Nominal capacities from 124 to 3.128 kW for units in FRP with axial fans and from 115 to 1.878 kW for units with radial fans. Nominal capacities from 118 to 4.883 kW for units in galvanized steel with axial fans and from 154 to 3.120 kW with radial fans. CORROSION FREE: The urban and industrial areas polluted atmosphere increases the danger of corrosion for evaporative equipment. The use of FRP specifically designed for this application makes the cooling tower resistant to atmospheric corrosion and drastically reduces the maintenance operations. Service life warranty for the casing against corrosion means unlimited life without maintenance operations. NO TRANSMISSION: impellers are directly coupled to special electric motors appropriate to work in humid atmosphere. No maintenance is therefore required and there is no risk of belt breaking. The electric box connections is transferred outside the cooling tower. HIGH EFFICIENCY: axial fans are formed by adjustable pitch blades manufactured in glass reinforced polypropylene (PPG) which is highly resistant to abrasion and hub in cast aluminium. The blades air foil profile provides a high efficiency with a low noise level. The aerodynamic fan cylinder modeled in PRFV contributes to improve the efficiency. EASY MAINTENANCE: cooling towers are equipped with one or several large access doors for maintenance and/or removal of the wet deck filling the headers with spraying nozzles or the drift eliminators. The water spraying rubber nozzles are centrifugal type without internal helix and diameter outlet to avoid obstructions. The rubber nozzles can be removed quickly from the headers due to the absence of screws. The air intake grids made up of PVC modeled sheets glued contained in a stain less steel frames in such that is easy to take out for access. This grid type prevents the entrance the strange bodies the water splash on the outside and avoids the sunlight entrance hindering the algae growing or other microorganisms’ proliferation. The cold water basin has sloped design for easy drain and cleaning. SINGLE PIECE: the external casing including the fan volute is modeled as an entire piece without flanges screws gaskets or anything else that can cause leakage. The FRP piece is internally reinforced in order to guarantee the maximum robustness. Even if properly sealed at the factory often cooling towers show leakage due to transportation and installation stresses. This cannot happen to TVC towers. LOW NOISE LEVEL: It is the most outstanding characteristic in the TVC version. All the standard models of the TVC series have the fan section completely closed and isolated with sound absorbing material. In addition to the FRP material of the fan casing. This allows an exceptionally quiet operation with a lower noise level than by cooling towers made of steel sheets. The fact of choosing ventilation sections with single fan which has a big diameter and low speed (two in the superior models) provides a silent operation. On request and for the installations that doesn’t need a special reduced noise level the TVC series is available without acoustic compartment. Moreover the TVC towers design makes it particularly easy to connect inlet and outlet air sound attenuators for the particularly noise sensitive installations. This possibility with addition of its reduced height dimensions makes the TVC an ideal machine for urban facilities such as shopping centers indoor installations or non-industrial locations where certain discretion is required. 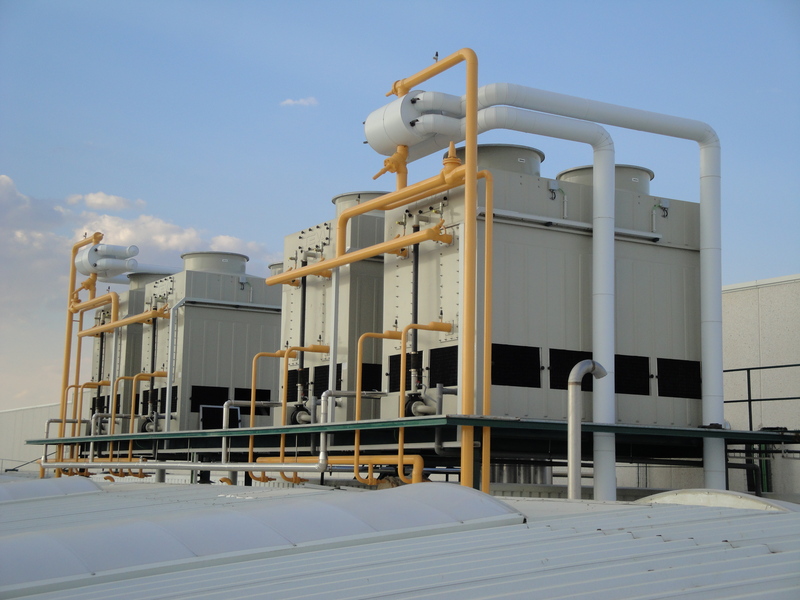 LOW PROFILE: often the cooling towers are installed in recessed premises or being concealed on top of modern buildings; The TVC version facilitate this type of installation owing to the reduced height. For installations indoors with overpressure please contact our technical-sales department. The EXCHANGE COILS by closed circuit cooling towers are made of prime quality steel pipes with thickness of 1.5 mm that are submitted to strict high pressure tests. The coil is galvanized later on by dipping in melted zinc. The zinc deposit is superior at 80 microns (600g/m2) which grants an unlimited protection. Optionally available in stainless steel execution as well. Thinking of getting a REDUCED POWER CONSUMPTION design of blades of axial fans of the CMA have a streamlined profile that provides high performance with reduced noise level in addition to being directly coupled to electric motors avoid power transmission losses.With the same aim the coil height has been intentionally reduced despite its higher cost of manufacturing. All this makes the CMA series an evaporative condenser with a power absorbed particularly reduced. EASY CONTAINERIZED TRANSPORT: The CVA series of evaporative condensers contain within its range models designed with adequate size to be easily transported and reducing costs in a standard or high cube container which excludes the use of expensive special transports. The CVA is supplied absolutely assembled and the bigger models come in two sections. The assembly operation is a simple superposition of the two sections and their fixati on with screws.